Southern Illinois has been called "Egypt" for more than two centuries. Here's why. Of all the mysteries of southern Illinois, none is as curious as how the region took the name "Egypt." Historians and folklorists have debated the name for decades, agreeing only that it dates back to the antebellum days before Abraham Lincoln became president. But students and historians searching 19th century records for a cause or explanation have missed their mark by nearly a century. Junction of the Ohio and Mississippi rivers, circa 1858. Photo courtesy the Abraham Lincoln Presidential Library. Our American ancestors saw the North American continent as the fabled land of milk and honey. The more religious, particularly the Puritans, saw the land as a place where they could grow a new society free of the evils and sin of the Old World. Here they could build their new Jerusalem, their city on a hill, and they did, or at least attempted to with their settlement of Salem in the Plymouth Colony. As Americans continued their ever-increasing westward expansion, they repeatedly found their lands of milk and honey, the new Canaan of their dreams, all of which brings up an interesting question. The Biblical Canaan represented the land where the Israelites settled following their escape from captivity in Egypt. So why did southern Illinois' earliest settlers looking for their own Canaan instead name the region "Egypt"? 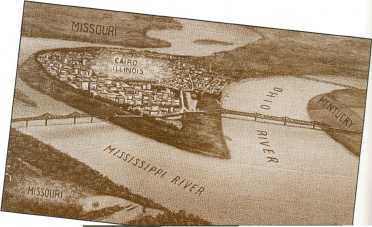 The usual debate argues the presence of Egyptian place-names such as Cairo and Thebes versus the story of central and northern lllinoisans traveling to southern Illinois after the "winter of the deep snow" to buy grain, much like the ancient Israelites who traveled into Egypt looking for food during a seven-year drought. Yet the answer to the question might be found in the first Egyptian name given to the region the Land of Goshen. 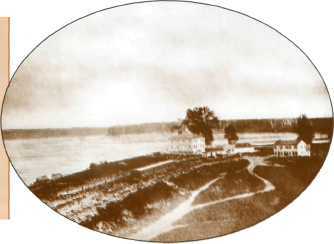 John Badgley, a Baptist missionary to the Illinois Country in the 1790s, provided the name while riding high atop the bluffs overlooking the American Bottoms in the area of modern-day Edwardsville. As a minister he was well aware of the stories in the Book of Genesis, particularly how the Israelites had settled in Egypt in the first place. At the end of the story of Joseph and his coat of many colors, the pharaoh gave Joseph's relatives the best land in Egypt, the area known as Goshen. two best-known features of Egypt, the Nile River and the pyramids, particularly those at Giza. Atop the bluffs, Badgley could have picked out the two most notable objects in the landscape, the Mississippi River and Cahokia Mounds, Illinois' version of pyramids. Goshen also fit because the region surely reminded Badgley of a foreign country, far more than the empty wilderness he had crossed at various times between the Illinois Country and the more established settlements to the east. The French settlements dated back nearly a century even then. Across the Mississippi River lay not a modern American metropolis, but a foreign country controlled by Spain. If the wilderness represented empty lands, the American Bottoms represented something else entirely, something ancient, something foreign. A centuries-old Indian trail ran across the region from the St. Louis/Cahokia Mounds area southeast to the saltworks near Equality in Gallatin County, Illinois. There, another ancient trail continued to the southeast, crossing the Ohio River a few miles upstream from Cave-in-Rock at what is now Weston, Kentucky, before continuing to the area of Nashville, Tennessee. Although, "Goshen" changed to Edwardsville after Ninian Edwards become territorial governor in 1809, the Goshen Trail kept its name long after. Decades later, when residents of upstate Illinois travelled south to buy grain they would use or cross his trail—and the early name "Egypt." If that didn't encourage the use of name, then the other place names did, particularly the early ones. The Thebes train depot, once home to a multi-track switching yard, was enormous compared to the Thebes post office, which more accurately reflects the community's size.Photos courtesy the Abraham Lincoln Presidential Library. Gallatin County court records as early as 1820, but the account, an application for a ferry license, references improvements that began as early as 1808. Backers of the Bank of Cairo and the City of Cairo bought 1,800 acres of land at the southern tip of the state during the summer of 1817. After the legislature approved the incorporation, the territorial governor signed the bill on January 9, 1818. The bank opened up next to the federal land office in Kaskaskia, but the town never got off the ground. Cairo the city wouldn't really develop until the mid-1830s, after the "winter of the deep snow." This might be the reason why there has always been confusion between the place-name version and the wagon-train version of how southern Illinois took the moniker Egypt. Nine men made up the incorporators of the bank and town. They included Shadrach Bond, who a year later would be Illinois' first state governor. The group also included two men from Alexandria, Virginia: Thomas Herbert and Charles Slade. Although more than one Alexandria had developed throughout the ancient world, the Mediterranean port in Egypt with its famous lighthouse, one of the seven ancient wonders of the world, is the best remembered. It's possible that one or both of these men suggested the Egyptian name of Cairo to go along with their grand schemes of a river metropolis. Before Cairo got off the ground in Alexander County, another Egyptian city sprang to life in the early county seat of Thebes. The attempt to build a new Alexandria on the banks of the Mississippi south of Thebes, however, proved a failure. 1960s. The Crab Orchard & Egyptian Railroad that started in the 1970s continues to serve industries in Marion and Herrin. Besides the names, southern Illinois is also known as Egypt because it served as the feed barn for the rest of the state in the early days before agriculture took hold on the prairies. The most widely quoted story dates back to the "winter of the deep snow." The winter of 1830-31 was long remembered as the Winter of Deep Snow. It is said that the winter was a mild one 'til Christmas. During the Christmas holidays a snowstorm began and for nine weeks, almost every day, it snowed. The snow melted little or none and was found more than three feet in places. The old fashioned 'stake & rider' fences were buried in many places with the drifted snow. The long country lanes were covered over so that no sign of the road was left. On top of this snow fell rain and sleet and formed such a crust that people and stock might walk on top of the snow. The birds and small game suffered very much for want of food, while larger wild game became very tame. Southern Illinois historian Barbara Burr Hubbs wrote in the first issue of the regional magazine Egyptian Key in 1943, "caravans of eight and ten wagons formed, to go south and buy bread stuff, grain for the cattle, and seed for the next crop. These pioneers were familiar with their Bibles, and a common answer to a greeting on the road became, 'We are the sons of Jacob, going into Egypt to buy corn.' Southern Illinois became known as the granary of the State. The name Egypt was accepted proudly." The southern part of the state, known as Egypt, received this appellation, was here indicated, because being older, better settled and cultivated, it gathered corn as sand of the sea, and the immigration of the central part of the state, after the manner of the children of Israel in their want, went thither to buy and bring then that they might live and not die. This idea of Egypt as a breadbasket may go back even earlier than 1824. In 1816, a group of Gallatin County men traveled north to plat the new county seat of White County. They gave the village on the Little Wabash River the name of Carmi. For people who study the genealogical lists in the Bible, Carmi was one of Jacob's grandsons and Joseph's nephew who came with his father Rueben to settle in the land of Goshen. Both Abraham Lincoln and Stephen A. Douglas used the term "Egypt" during their famous debates in 1858. Later, during the Civil War, a group of residents in southeastern Illinois presented General Ulysses S. Grant with a horse named "Egypt" in hopes that the name would become famous along with the general's exploits. If this is the history of how southern Illinois became known as Egypt, then what is its geography? Just how large an area should be considered Egypt? Many people today consider only the southern 16 or 17 counties of Illinois (Mount Vernon south) as Egypt. This area kept the name because all of the current Egyptian place names are within it. This was the region where early settlers could get grain and corn after the "Winter of Deep Snow." But if southern Illinois took the name Goshen from the fertile valley of the American Bottoms and the remnants of an ancient civilization at Cahokia Mounds, then shouldn't the area be larger? There's evidence that it was. During the 1920s and '30s, many residents considered Egypt to include the whole southern third of the state. At that time a newspaper association took the name of Egypt's Associated Dailies. One of the lead papers was the Sentinel of Centralia, which is definitely outside the 17-county region. Even today, visitors to the paper can marvel at the Egyptian architectural motif both inside and outside of its headquarters building. The Southern Illinois Development Association promoted the "Egyptian Empire" of the southern 32 counties of Illinois. In 1939, the Chicago Egyptian Club showed 34 counties on its letterhead, which included towns as far north as Effingham and Vandalia. At one time Egypt might have covered an even larger area. In 1833, the Sangamo Journal mentioned a settlement named Egypt in Morgan County west of Springfield. 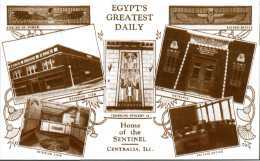 The federal government opened an Egypt Station post office on February 12, 1858, in Mason County north of Springfield. In 1861, the post office name changed to Manito and is still active. Marion, Illinois, started out small in terms of self-promotion, calling itself the "Heart of Egypt." In 1922, the Marion Daily Republican published an industrial development booklet that defined Egypt as "that portion of Illinois, south of the Vandalia railroad, bounded roughly on the north by a straight line from St. Louis, Mo., to Terre Haute, Ind." The year 1922 proved to be a good year for the region according to the paper, which quoted from the January 21, 1922, issue of Editor and Publisher's Market Survey of Illinois. Egypt is that prosperous empire of payrolls, which during the 1921 business depression produced more business and orders than any section in the Middle West. Business is good in Egypt; business has been good in Egypt for several years. Depression has been known only by reading of it in other sections. Egypt is the fastest growing part of Illinois. Egypt is a peculiarly rich store-house of wealth and opportunity where thriving cities are many, where living is easy and where payrolls have plenty of money for those who have the will to earn by business their share. The growth of the interurban railroads that interconnected the coalfields of southern Illinois in the first two decades of this century, and later the growth of modern highways, led to the consumer market of southern Illinois today.That market is generally along Interstate 57 and Route 13. Although some people fought against it, the name "Little Egypt" began to be used more and more for the southern 16 or 17 counties. Will Griffith, publisher of the Egyptian Key magazine of the 1940s, stood as one of the fiercest opponents of Little Egypt. To Griffith, the founder of the Greater Egypt Association, "Little Egypt" was simply the name of a "hootchie-kootchie" dancer at the 1893 Columbian Exposition in Chicago, and he felt that to use it for southern Illinois was an insult. In 1951, Hollywood made a risque movie about Little Egypt and her famous shakes and wiggles. Fans of the television hit series "M*A*S*H" might remember that in one episode, Colonel Henry Potter refers to the camp water tower in high wind as "having more shakes than Little Egypt." Griffin got half of his wish. More people today use "Little Egypt" than "Egypt," but his name of Greater Egypt lives on in the Greater Egypt Regional Planning Commission that covers Franklin, Jackson, Jefferson, Perry, and Williamson counties. Jon Musgrave serves on the Advisory Board of the Illinois State Historical Society. He teaches journalism, photography, and video production at Shawnee Community College near Ullin, and publishes the IllinoisHistory.com online site. He can be reached by e-mail at jmusgrave@onecliq.net.